In January, two Colorado ice climbers (who wish to remain anonymous) started up their second first ascent of the day in a secluded and relatively unknown canyon high in the Raggeds Wilderness of Western Colorado. After 25 feet, the leader found the ice too thin for a screw, but continued and found one good screw placement at 75 feet. He got no other pro for the remainder of the 230-foot pitch. With no anchor in sight and out of rope, he had the belayer take him off belay, and the leader continued climbing. When he leaned back and weighted the rope (unavoidable for the first 10 feet because of the steepness), he plummeted. Miraculously, he landed upside-down 15 feet below, in a strip of soft snow pasted into a dihedral. He was uninjured except for two deep vampire-like crampon punctures in a thigh. He climbed back up expecting to find that the rock stack had toppled, but found it still standing. The rappel cord had instead come untied. He retied the cord using a figure-8 bend. This time the knot held, and he was able to down climb/lower to the screw, pull the rope and rig a rappel off the screw to the ground. The figure-8 version of the Euro-Death Knot (EDK), far left, might seem more reliable than the overhand EDK, but when the knot is loaded as it would be when it joins two rappel ropes or is tied to make a sling, the load pulls the knot apart (right) causing it to roll or “capsize.” Potentially, the EDK could continue rolling until the knot spills off the end of the ropes. Many climbers use and love the EDK, believing that it is the best knot for tying two ropes together because of its ease of tying and its low profile, which makes it less likely to snag when pulled down the wall during a rappelrope retrieval. The knot can, however, flip and roll down the rope (known as “capsizing”), and if the knot tails aren’t sufficiently long, the EDK can roll all the way out, coming completely untied. While the figure-8 version of the EDK, the one used in this accident, might seem safer than the standard overhand EDK, it is in fact more, not less, likely to roll and untie itself. At least four accidents (in Zion in 2002; Grand Teton National Park in 1997; Big Cottonwood Canyon in 1995; and Seneca Rock in 1994) with three fatalities have been attributed to EDK failure. Three of these accidents involved the figure-8 version of the EDK; one involved a flat overhand. If indeed this recent accident was caused by an EDK untying itself, it may be a rare instance where the climber survived to tell the tale. The issue warrants more research into the reliability of the EDK. Every climbing knot has to be tied perfectly every time. There is no margin for error! The EDK in this case may have rolled and continued rolling until the knot was undone, but this is unlikely. Even if this is what happened, the accident was avoidable simply by using a more reliable knot such as a figure-8 bend, which the climber ultimately used. Many climbers use the EDK and its figure-8 variation to join rappel ropes. 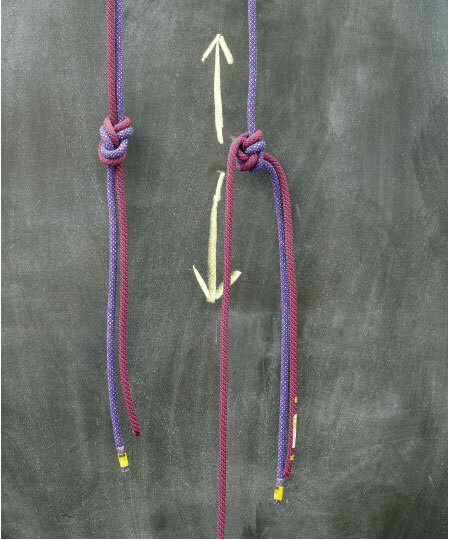 If you use the EDK, use the overhand version, and tie two EDKs in a series on the rope and leave foot-long tails. Even so, there is no reason to use the EDK to tie slings or for rigging a rappel anchor, since just about any other knot is less likely to untie. Regardless of the knot, the climber made a fundamental mistake by trusting just one sling with one biner. He had enough cord to cut into two slings, and sling the anchor twice. Even if one knot had come undone, sling redundancy could have prevented the accident. No matter your level of experience, make redundancy a habit. Don’t rely on guardian angels and snowpatches. This article was published in Rock and Ice issue 233 (April 2016).